if that title doesn't get your attention, I don't know what will. Once upon a time, I checked off the tedious task of organizing my Pinterest boards from my to-do list. By doing so, I pretty much dug my own grave, so to speak. BUT DON'T I LOOK SO DELICIOUS? YOU KNOW YOU WANT TO MAKE ME! It's true... I prefer to cook. Baking is so much more difficult. Exact measurements? Flour all over the counter tops? Reading directions? Eh, not a huge fan. But scraping every last ounce of batter from the mixing bowl? THAT I can handle. Last night, after laying on the couch for hours with a yucky cold, I decided to get a little crazy and bake these cookies that had been calling my name through my computer screen for months. If I was going to bake (and when I'm sick at that), they needed to be worth the calories (sometimes you just gotta break that diet!) and these looked pretty legit. Take my word for it: they are! Make them for your family. Make them for when that dreaded time of the month comes around (too much?). Make them for a party. JUST MAKE THEM. I did change up the filling a bit by using the Dark & Sea Salt Caramel squares, instead of the regular Caramel squares the original recipe calls for. I'm a sucker for sea salt so it was a no-brainer, but use whatever kind you prefer! -I did halfies when making these. I used half the batter to make them deep dish, and the other half to make regular cookies. Only because I wanted some regular ones to enjoy as well. I'm picky. -I take no responsibility for your pants fitting a little bit tighter after making these. My suggestion would to get your fix and then kindly pass them onto your friends and family to enjoy. That's my plan, anyways. Those look to-die-for and now I want them for breakfast! Pinning this to make later:) Thanks for the diabetes. Those look delicious and seriously dangerous! Wow....I should just welcome back the 4lbs I just lost right now....cuz those look seriously stupid yummy! Um. These will 100% be made in my house.. SOON! you had me at Dark Chocolate Sea Salt.. Damn I need some of these in my life. Holy yum those look so good!!! and dangerous haha... Hope you are feeling better today, chica! Hello yum. Those look heavenly! I was looking through my Pinterest boards for a specific recipe yesterday, and like you, now I want to make ALL of the cakes/cookies/pies/desserts on my board! Bad idea!! you stop this! my thighs can't handle it!! I had to skip right through this post.. I still have pregnant hormones running through my body and in five weeks have put on pounds! This.Post.Is.Trouble. Those do look like heaven! I don't know if you're evil for posting these...or an angel! 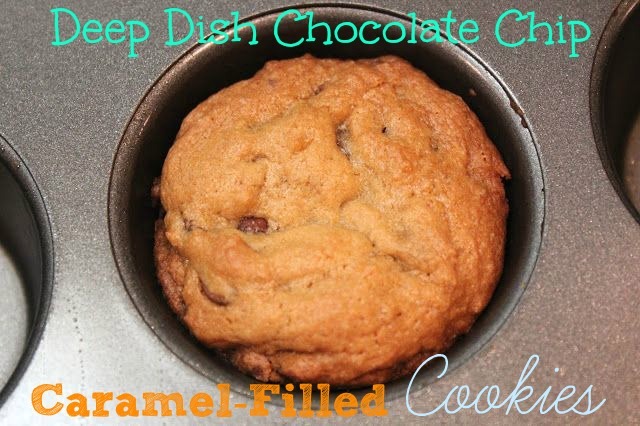 Pretty sure these will be baked in the near future in my kitchen! Oh goodness I need these and I need them right meow. you had me at caramel, YUM! I've been looking for more dessert recipes and this is going in the book! STOP!! I just gained 5 lbs. BUT YUM! 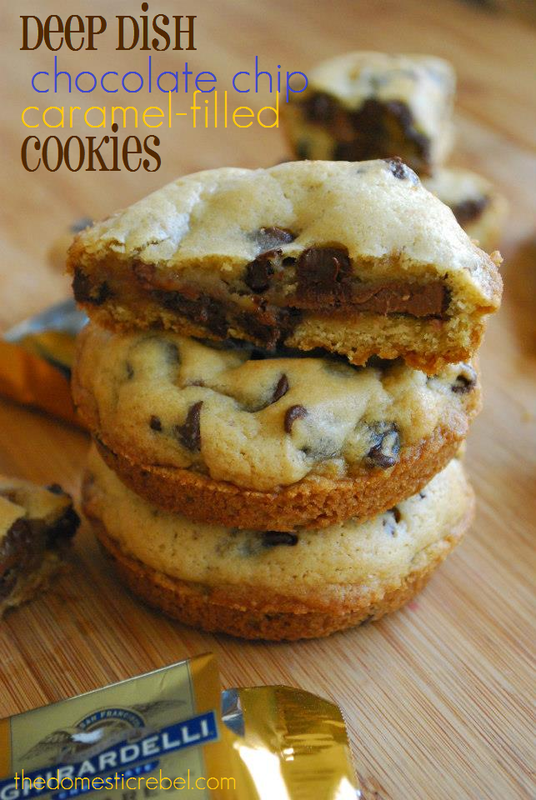 I definitely need to make a gluten free version of these. I'll go with good friend. :) Thanks for sharing. YUM!!! Ohhhh my holiness. I'm salivating. I almost wish I hadn't seen this!! I'm pinning it. I never thought about cookies in a muffin tin. Brilliant!! Oh my gosh they look delicious. YUM! These look delicious! I on the other hand would rather bake than cook so I will have to try these! Well these look absolutely delicious. I have a feeling I am going to find myself in the kitchen sometime this weekend making these! Thanks for the recipe! i'm not a chef but these definitely look like they'd be worth pulling my betty crocker pants out of the drawer! and then they are the pants I will probably have to live in after eating these!